Nature Made Dual Action Probiotic + Energy‡† B12 Gummies are perfect for adults who want a tastier, more pleasant way to take probiotics. Our Dual Action Probiotic + Energy‡† B12 Gummies come in delicious raspberry and cherry flavors. Not only do they taste good, they also include Probiotics that naturally help support digestive health and Vitamin B12 that supports cellular energy production.† Don’t let occasional digestive issues slow you down, keep moving with Nature Made Dual Action Probiotic + Energy‡† B12 Gummies! Stop Use Indications: Keep bottle tightly closed. Store in a cool, dry place, at or below 75° F (23° C), out of the reach of children. Do not use if imprinted seal under cap is broken or missing. 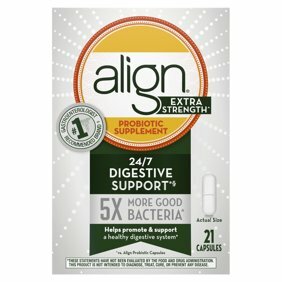 Ingredients: Bacillus Coagulans IS-2 4 Billion CFU [Formulated to Provide at Least 4 Billion Live Cells Per Serving if Continuously Stored in a Cool, Dry Place at or Below 75 Degrees F (23 Degrees C) and Consumed Prior to Expiration Date. Storage and Handling Conditions Can Vary, and May Affect the Total Amount of Cells Delivered at Time of Consumption]. Other Ingredients: Glucose Syrup, Sugar, Pineapple Juice Concentrate, Wheat Starch, Gelatin, Invert Sugar, Propylene Glycol, Citric Acid, Sodium Citrate, Colors Added (Including Carmine), Natural Flavors, Coconut Oil, Carnauba Wax, White Beeswax. Instructions: Chew two gummies daily.